FREE EARLY BIRD to show your interest! Skiing Camp at Mount Ruapehu Ski Resort, Whakapapa, Central Island. 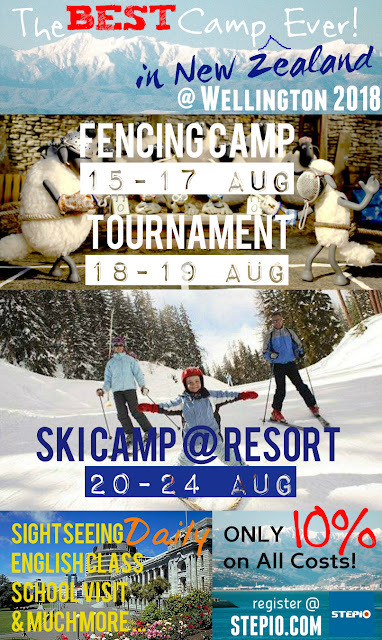 20-24 August -- Skiing Camp, 5 days. Registration Confirmation : All FCs to extend the final list of applicants to Coach Cui on or before 30 June. Beginners' Lesson : Small group and individual beginners' lessons to be conducted by Lower Hutt and Wellington South coaches on the venue. Beginners' Lesson : Small group and individual beginners' lessons to be conducted by Coach Dong and local resort coaches on the venue. Show & Tell Session after dinner for participated fencers. Casual Visit to Wellington Primary School and Wellington High School, Wellington, New Zealand; National Park School, Ruapehu. USD3,900 for 10 days (All Costs + 10% Service Charge). Private Lesson - NZD70 per 30-minute lesson, with your selected Coach; reserve with STEPIO earlier once completing pre-registration; subject to in-advance booking and availability. Support Coach : 2 assistant coaches from Low Hutt and Christchurch South Fencing Clubs. Volunteer : for care-taking (volunteer parents), coaching (volunteer fencers), translation (Wellington High School students), referee (fencers & club coaches). Criteria : fencers to participate in full program (2 sessions per day for 5 days) should have higher priority. Accommodation : Included, can be arranged for foreign fencers and local fencers from remoted areas; Wellington City Hotel and Ruapehu Resorts; rates to be confirmed (with and without breakfast). Tavel Cost : Included; Local transport, to and from venues included; international flight round-trip included; subject to availability of seats. Potluck Dinner : Included; NZD20 per fencer; 24 August evening.